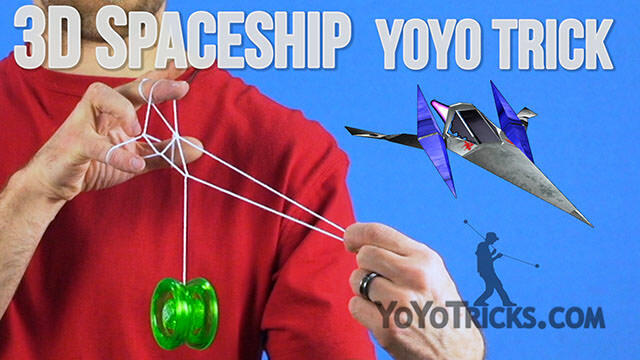 Learn the 3D Spaceship Yoyo Picture Trick, also recognized as the Starfox Arwing. This is a picture trick. 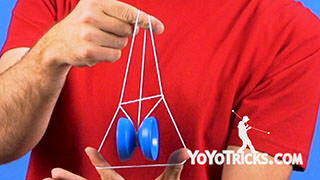 So the easiest way to learn it is probably to just have a dead yoyo. 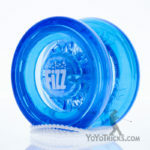 Then you will not have the pressure of the yoyo spinning the whole time. 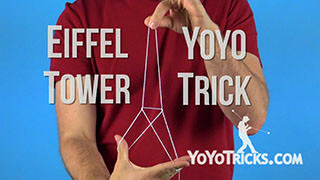 The first thing that you want to do when you learn this trick is make sure that you have mastered Eiffel Tower. 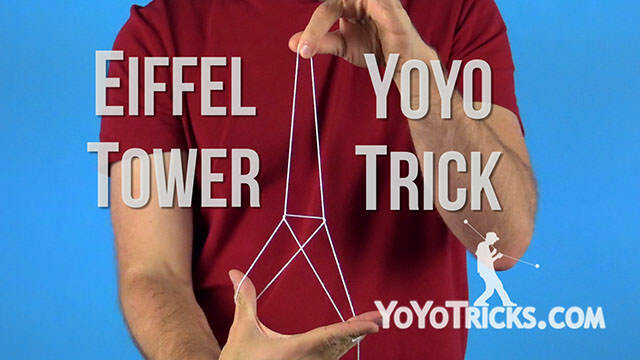 If you learned the Eiffel Tower from us, there is one change that you are going to need to make to the trick in order to get this trick to work. 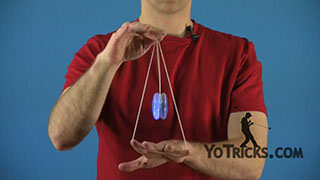 That is right at the beginning, when you do the slingshot portion of the trick, you are going to want to get the string on the opposite side of your thumb before you complete the rest of the trick. You will know that you have done that right if your thumb ends up pointing forward when it is on your throwhand side with no twists in the string. Once you have the Eiffel Tower, then you can progress to the rest of the trick. 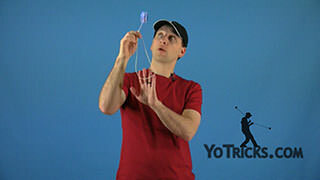 So, the next thing you want to do is, instead of pinching the string to complete the Eiffel Tower, what you want to do is take your pinky on your yoyo hand, and you are going to wrap the string coming off the yoyo around your pinky. There is a really specific way to do this. What you want to do is take the palm side of your pinky. Push it into the front of the string. You want to wrap the string around your pinky one time with your pinky facing upward. That can be a pretty awkward motion. You are probably going to be tempted to point your pinky down when you do the wrap. But that will end up having a little bit of a twist in one of the wings of the Arwing, it is not going to fly right, so make sure that you get this part of the trick right. 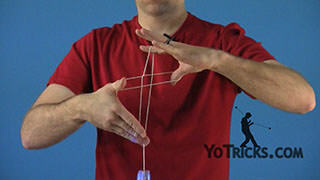 So again, just bring your palm side into the string, and wrap it around one time with your pinky facing upward. 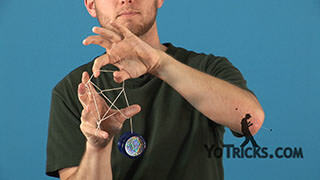 Now, once you have this, what you want to do is position your pinky right at the top of the tower, and this little triangle that is right in the middle of the tower, what you want to do is reach through with your yoyo finger. 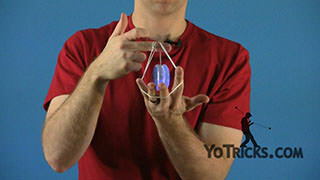 With the back of your yoyo finger, pull the string coming off of your pinky, right through that triangle. 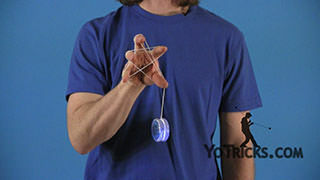 Then to complete the trick, what you want to do is take your first finger on your opposite hand, and grab the string coming off of the yoyo. Just pull it through, that would be the top of the tower, I suppose. Let the rest of the strings fall off your hand. Then you can give the trick a little bit of shape. And that is the 3D Spaceship. Now, a lot of times, what will happen when you are new to this trick, and it can happen other times as well, is the wing coming off of your pinky might end up being too small. Especially in comparison to the wing coming off of your thumb. To keep this from happening, when you initially get the wrap of string around your pinky, a lot of times it will be butted right up against the rest of the tower. So you are going to want to extend your pinky away from the tower to give yourself some distance. Then make sure that you keep that distance as you perform the rest of the trick, and that way you will be able to balance out the size of the wings so that your trick ends up looking like a proper Arwing. So, that is how you do the trick, let’s take a look at it one more time from the player’s perspective. So again, to start this trick, what I like to do is lift the string with my thumb and that way when I pull the slingshot through, the string is on the opposite side of my thumb, the way that you want it. Then you are just going to finish the Eiffel Tower, like you normally would. 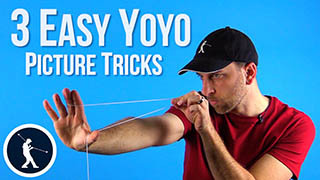 When you get to this part, again take your pinky on your yoyo hand, and you are going to push the palm side of your pinky into the front of the string. Wrap the string around your pinky with your pinky facing up. 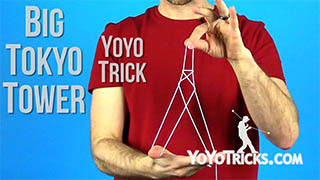 Then you are going to hold that string up so that you can reach through the triangle part of the tower with your yoyo finger. Lift that string up. And then sometimes I bring my hands together at this point, if I do not have quite enough distance of string left. 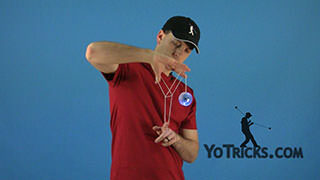 Then the last part, you are going to use your first finger on your opposite hand to hook the string coming off of the yoyo. Then just give it some shape. And that is the 3D Spaceship. As you work on all of these things and you put them all together, it will take some time to get the flow down, and to get it all to look right, but once you have got it, it is a really neat trick, and that is the 3D Spaceship.